PRISTINA, Kosovo—On this brisk but cloudless Feb. 17 day, thousands of people descend onto the pedestrian thoroughfare of Saint Mother Teresa Boulevard in central Pristina to celebrate Kosovo’s 11th Independence Day. 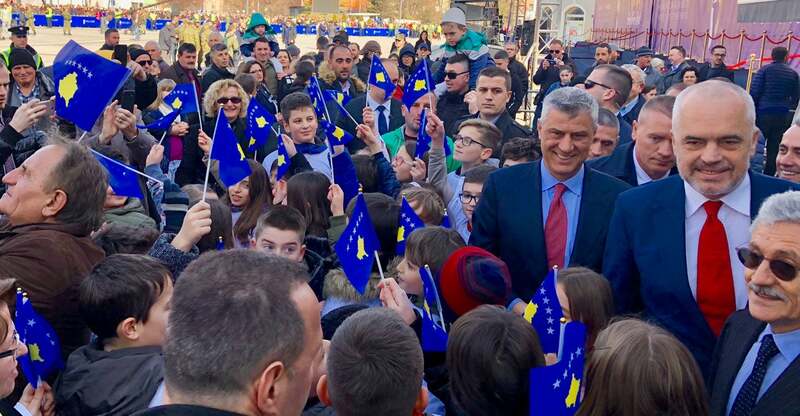 “We fought for our freedom and our independence, and we would have never won the war on our own—the U.S. is the savior of the people of Kosovo,” Kosovar President Hashim Thaçi tells The Daily Signal during an interview at his offices in Pristina. The Independence Day festivities testify to the Kosovar people’s pride in their country’s hard-earned independence, as well as their gratitude for the U.S.-led NATO air war in 1999, which reversed a Serbian ethnic cleansing campaign and saved their country from catastrophe. Freedom, after all, is especially precious for people who know the alternative. From the front door of Scandé Café in central Pristina, 38-year-old waiter Fadil Azemi observes the Independence Day festivities on Saint Mother Teresa Boulevard. He stands with arms folded across his chest and a smile on his face. He refuses to let this correspondent pay for lunch. A statue of former U.S. President Bill Clinton in central Pristina, evidence of Kosovo’s widespread pro-Americanism.